A Great Outdoor Gift for anyone! Whether it’s the person who already has “everything” or you simply know they love to pick it out themselves, the GOPC Gift card is an ideal choice.Our gift cards are available in Whole dollar amounts from $10 to $1000 and are redeemable through any of our 9 convenient locations. Need to check your balance? Call Your Local Shop. Our Gift Cards are rechargeable – This can be done at any shop location. 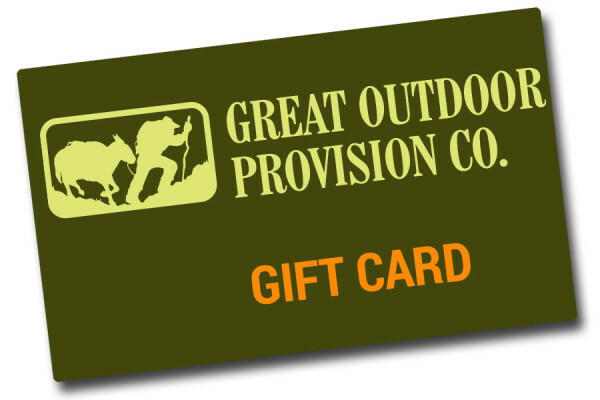 Value on card may be applied toward any purchase at Great Outdoor Provision Co. Card is not redeemable, in whole or part, for cash, and cannot be replaced if lost or stolen. We can do our best to help you find something you’ll love, no matter what your interests. And by the way, we sell shoes you can resole, fleece made of recycled goods, and print on recycled paper whenever possible, so remember you can always add more money to this gift card and save a little plastic.